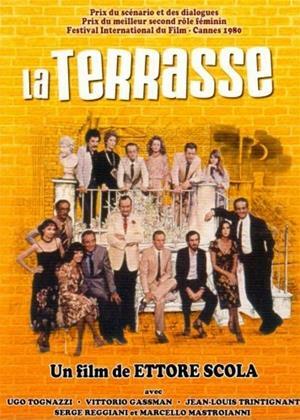 Vittorio Gassman, Ugo Tognazzi, Jean-Louis Trintignant et al. Perhaps a little over-ambitious for the casual audience unfamiliar with the Italian world of entertainment and politics, "The Terrace" involves a total of eight main protagonists and how they have changed or are changing. All eight are sitting on a terrace talking, while flashbacks and flashforwards fill in their past, present, and future relationships. Enrico (Jean-Louis Tritignant) is a burnt-out screenwriter, Amedeo (Ugo Tognazzi) is a self-made producer, Mario (Vittorio Gassman) is a communist member of parliament who is having an affair with the married Giovanna (Stefania Sandrelli) and is otherwise having a hard time trying to tow the tough, virtuous line the party demands. Giovanna, as well as the other women on the terrace, have all the spirit of people looking forward to the future while the men have been there and found it wanting.